Title: 03/07/2007 - Use of generic MSDSs written by third-party companies and employer responsiblities when using an online MSDS service. This 400,000+ MSDS database from Safety Emporium features manufacturer-specific sheets. This is in response to your correspondence dated May 2, 2006 to the Occupational Safety and Health Administration's (OSHA's) Directorate of Enforcement Programs. This letter constitutes OSHA's interpretation only of the requirements discussed and may not be applicable to any questions not delineated within your original correspondence. In your letter you requested an interpretation regarding the material safety data sheet (MSDS) provisions of OSHA's hazard communication standard (HCS), 29 CFR 1910.1200. You specifically asked about the legitimacy of using generic MSDSs and MSDS locator services to comply with the applicable portions of the HCS. Your scenarios are paraphrased with your questions below, followed by OSHA's response. Scenario 1: You describe companies that provide employers with electronic MSDS access services. These services are provided either online or on CD-ROM. You state that these companies provide generic MSDSs for chemical products and that these MSDSs do not contain the name of any specific chemical manufacturer, and that they may contain incomplete information regarding the chemical composition and hazards of the substance. Your concern is that these types of generic MSDSs and the associated supply services do not meet the intent of the HCS. Question 1: Do generic MSDSs written by third-party companies meet the requirements of the hazard communication standard? 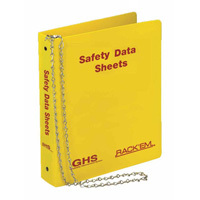 Reply 1: A material safety data sheet must be specific to each manufacturer's product. Each MSDS must contain, at a minimum, the information required by the HCS; 29 CFR 1910.1200(g)(2)(i)-1910.1200(g)(2)(xii). Included in those provisions are requirements for the manufacturer/importer to provide their name, address, and telephone number or the same information for someone designated as a "responsible party." The "responsible party" would then be obligated to be the primary contact, as opposed to the manufacturer, for providing additional information about the chemical product to include product hazards and appropriate emergency procedures. Therefore generic MSDSs, which are not specific to the manufacturer and to the chemicals being used in the workplace, and which do not contain the name and contact information of the responsible party for the content of the data sheet, do not meet the intent of the HCS. Please be aware that OSHA does allow for manufacturers to prepare "generic" MSDSs for different products which contain the same chemical in different proportions and that otherwise conform to the requirements of 29 CFR 1910.1200(g). Your letter also stated that "generic" MSDSs may contain health and safety hazard information that may not be indicative of the latest available heath information for those substances and that the information reflected on the generic MSDSs may be "substantially different or lacking." As previously stated, the "generic MSDSs" described in your letter would not meet the intent of the HCS if it lacks critical identifying information. The HCS is a performance-oriented standard, however, and although there are specific requirements for MSDS content, there is some variability in terminology that may be found on MSDSs from different manufacturers for chemical products with primarily the same content. The scientific accuracy of the information provided is the essential requirement. Scenario: Your letter describes situations where employers use on-line MSDS access services. You indicate that, in your opinion, it would be impossible for a third-party electronic MSDS repository to maintain copies of MSDSs for every chemical that is potentially used by an employer. Your concern is that on-line MSDS access services may not meet the intent of the HCS, if an MSDS for the specific chemical being used is not available at the time it is requested. Question 2: Under what conditions can employers rely on on-line MSDS services to make available to them the MSDS for a specific chemical used by that employer when the employer has not provided the service with the MSDS document? 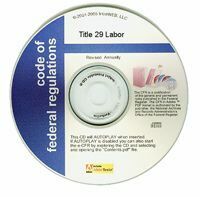 Get Title 29 of the US Federal Code, in searchable hypertext PDF format on CD-ROM from Safety Emporium. Reply 2: OSHA's hazard communication standard requires MSDSs for the chemical used in the workplace to be readily accessible to employees. A letter of February 18, 1999 (to Senator Ron Weyden), states "... OSHA interprets "readily accessible" to mean immediate access to MSDSs. The employer has flexibility to determine how this will be accomplished and may provide the data sheets via paper copies, computer terminal access, or some other means of providing readable copy on-site." If an employer chooses to use an on-line MSDS service, it is the employer's obligation (under the HCS), not that of the access service, to ensure that the MSDSs for the specific products being used are available, accurately represent the same hazards as those being used, and that there are no barriers to employee access to the MSDSs. The following scenario provides further clarification to your question. If an employer had supplied an on-line MSDS service with copies of the MSDSs for the specific chemicals being used at his or her workplace, and the service was able to make that specific MSDS information immediately accessible pursuant to an on-line request, then those conditions would ensure that the intent of the standard was being met. Please note that OSHA has allowed electronic access to MSDSs for many years, and there are several existing letters of interpretation that provide additional discussion on this issue. Further information regarding MSDS electronic access, as well as many other topics can be found OSHA's web site at http://www.osha.gov. Thank you for your interest in occupational safety and health. We hope you find this information helpful. OSHA requirements are set by statute, standards, and regulations. Our interpretation letters explain these requirements and how they apply to particular circumstances, but they cannot create additional employer obligations. This letter constitutes OSHA's interpretation of the requirements discussed. Note that our enforcement guidance may be affected by changes to OSHA rules. Also, from time to time we update our guidance in response to new information. To keep apprised of such developments, you can consult OSHA's website at http://www.osha.gov . If you have any further questions, please feel free to contact the Office of Health Enforcement at (202) 693-2190.